After coming up with the first design I posted it on the Fighting Robot Association (FRA) forums to get some comments and suggestions. One of the worries was that it wouldn't be armoured enough to survive the spinners. Another concern raised was the need for a solid drive-train as the robot would need to be agile and fast to out manoeuvre opponents. You can visit the forum post here. All the internal UHMWPE support/structure is being replaced with 2"x1"x0.125" aluminium (6063 T3) channel. I'll be buying it from Aluminium Warehouse and they offer a cutting service which I'll use to get the lengths into ~500mm sections. 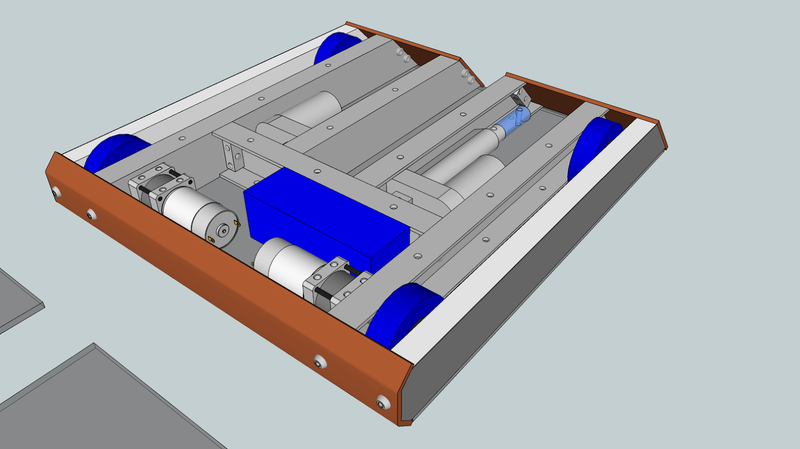 This massively simplifies the mounting of the motors not to mention improving the rigidity of the robot. I'm going to keep the 20mm & 0.5mm tool steel composite armour for the moment however it can be changed out later. 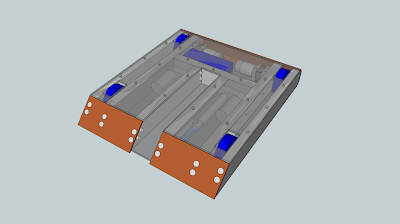 I'll make nut strip using 12mmx12mm aluminium bar with M6 threads and use that to connect the aluminium channel together. The front and rear armour has been upgraded to 4mm-6mm Hardox however this will need to be machined by someone with the tools. The top and bottom armour/covers will also be upgraded to 5mm polycarbonate however I'm not too sure how to mount these. The lifter will now be powered by 2 linear actuators from Gimson but the overall design & calculations are still in progress. The wheels will be Banebots 2-7/8" Shure 50 tires with 3/4" hex mounting, I'll then use the 1/2" to 3/4" key way mount to affix these to the shafts. The gears will hopefully be attached to the wheels but I may get HPC to put a 1/2" key way mount on them too. The revised total weight is 8.3kg minus lifting arm and revised total cost is £414.06. *tock tock* Is this thing on?